In his interview with Milo Yiannopoulous, Michael Malice discussed his experiences visiting North Korea. As a Jewish child born under the Soviet Union, he was all too familiar with the kind of oppression the Communist dictatorship shows to its people. He describes the labor and concentration camps North Korean citizens are forced into. The conditions people face can only be described as deplorable. North Korea’s horrendous human rights record has been well-documented. Not that long ago, a soldier fled the country because he was sick and starving. The South Korean doctor who operated on him said he never saw a man in that condition. The parasites that were in the soldier’s body are only discussed in textbooks. For decades North Korea has been a tangible threat to peaceful nations. They regularly threaten democratic nations like South Korea and Japan. In recent years their dictator Kim Jong-Un has promised to wipe the United States off the map. His aggressive nuclear expansion—while his people starve—has forced the ever-political United Nations to hit North Korea with severe sanctions. In many cases, the only way North Koreans can thrive is through black market smuggling. Uh, what? Guys, this is North Korea. You know, the country that threatened to hit America with an EMP bomb? The country that continues to fire missiles at Japan, one of our closest allies. The article goes on to compare Yo-Jong to—of all people—Ivanka Trump, making the propaganda artist look like a member of the glitterati. CNN wasn’t the only liberal outlet to do this. James Hasson of the Federalist listed every outlet that had fawning praise of Yo-Jong and North Korea in general. Here are stories fawning over North Korea at the Olympics from: -Wapo -Wall Street Journal -NYT -CNN -ABC News -NBC News -NPR -Time -The Telegraph Oh and here are articles from a few weeks ago warning that NK would use the Olympics as a propaganda offensive. Good job, guys. ABC wrote that North Korea’s cheerleaders “command the spotlight” with their creepy chants. New York Times called them an “army of beauties.” NPR stupidly criticized Mike Pence for “snubbing” North Korea’s visit, as if he was being disgraceful. The media is reporting on North Korea the same way they praise Oscar parties. Have they lost their mind, or am I taking crazy pills? 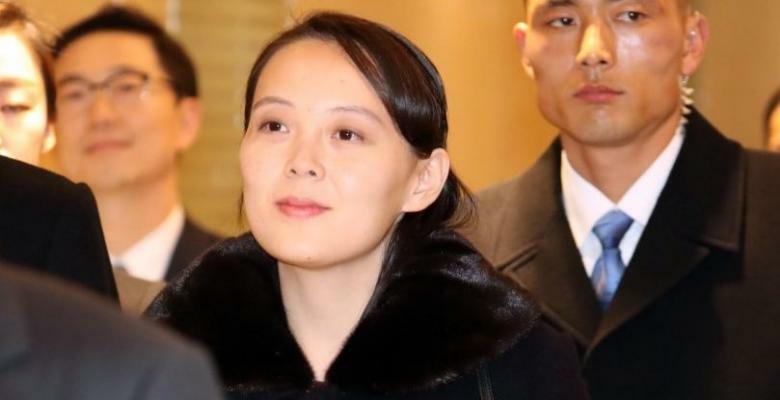 Keep in mind, Kim Yo-Jong is the sister of Kim Jong-un, the insane dictator who murdered his half-brother. She is the Director of the Propaganda and Agitation Department of their Communist Party. Read that title again. If there was ever a more horrendous, almost laughable, department, I can’t think of it. She is literally in charge of spreading lies that agitate and deceive the public. She’s probably the one who releases statements slandering the U.S. and promising our destruction. That can’t be possible, right? Can the media’s utter bias against the Trump administration really lead them to support a country that persecutes and kills its own citizens? A country that literally uses concentration camps to punish their people? Believe it. From the very beginning of the administration, Trump and Pence have taken a hard stance against North Korea. You might remember this pic, where the Vice President stared down the evil regime. Trump regularly confronts Kim Jong-Un directly on Twitter. It’s clear where the White House stands. In another time, that would have received applause from every American. The media would have supported a President in his opposition to such a terrible dictatorship. Not today. The media are so deranged in their hatred of the President that they’d actually try to puff up the image of North Korea. CNN even tried to make North Korea out to be a progressive country, because they employed a woman. Are you kidding me? Yo-Jong has as much blood on her hands as her brother does. They are complicit in the systematic oppression and destruction of their own people. And need I remind these blowhards: THEY WANT TO KILL AMERICANS. The media are actually trying to soften North Korea’s image among Americans, so that Trump’s hard stance seems unreasonable. If they can convince us that North Korea is actually kind of a nice place, then Trump’s opposition will come off as tyrannical and cruel. This is how desperate the media has become. They are sticking up for a country that opposes free speech, freedom of religion, free press, capitalism, and personal liberty. A country that is so backward, its own soldiers suffer from nightmarish parasites. But maybe it has nothing to do with Trump. Maybe the media really do love North Korea. Maybe they think the Stalin-like regime is a better place than the United States. All I can say to that is: they might as well go live there.